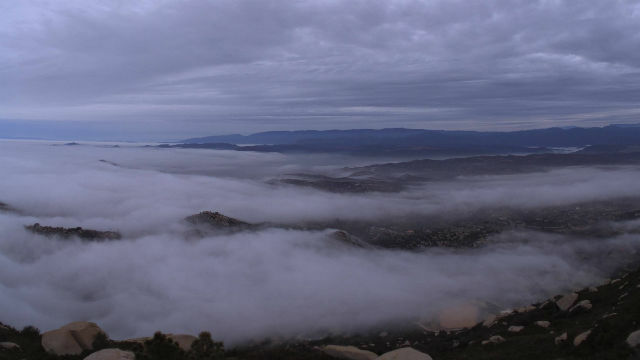 Clouds cover North San Diego County. File photo: UCSD camera on Mt. Woodson. Preliminary data from the National Weather Service show several San Diego communities broke cold weather records Tuesday. The shattered records were based on daytime temperatures, with the coldest being Palomar Mountain where the mercury rose to just 37 Tuesday afternoon. The last time a daytime high temperature was that brisk on Palomar was 1990, when conditions there hit just 38 degrees. Other record-breakers Tuesday included Vista at 60 degrees, where the old record was 62 in 2012; Alpine reached just 53 degrees, topping a 1978 record of 59; El Cajon warmed to a mere 61, much cooler than the previous record of 67 in 1983; and Borrego Springs at 68, breaking the 1973 record of 7o degrees. Ramona tied its 1978 record of 57 degrees. Campo also tied at 53 degrees, matching its 1955 record. The cold snap will continue through Wednesday, according to the NWS. But the low-pressure system that’s bringing the unusually cold weather is expected to clear out Thursday, bringing warmer temperatures and sunny skies to the region.